Trayning has natural granite outcrops, native birds, insects, reptiles, woodlands and stunning panoramas of wildflowers in season which are all easily accessible. Just 70 kilometres from Merredin in the heart of the North Eastern Wheatbelt, with good roads, the Shire attractions are well sign posted with maps readily available. 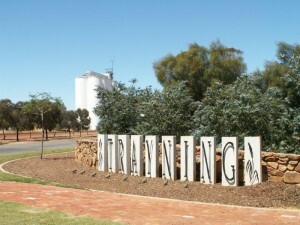 The name ‘Trayning’ was given to the district after the ‘Trayning Well’ and the name for the well was derived from two aboriginal names ‘Durri-iring’ or ‘Duranning’. Meaning ‘to crawl’, and ‘a camping place’ and over time became known as ’snake crawling in the grass near campsite’. Today the district produces mostly wheat and sheep and with its natural beauty and pioneer heritage Trayning is a MUST SEE Shire. Located between Wyalkatchem and Trayning along the Pioneers Pathway, only at Yelbeni Store will you find such unique customer service. All your farming/ tourist/ customer needs will be met over an informative and friendly chat and coffee. Just ask for Fred! 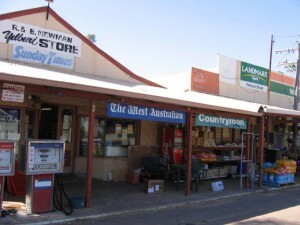 Due to the original Yelbeni store burning down in April 2007 it is currently operating out of the Yelbeni Town Hall, approx 50 metres behind the original stores location. Shop hours: Monday to Friday 8:30am – 5:30pm, Sat/Sun/Public Holidays 8:30am – 11:30am. Developed in 2002 the museum is an interesting and informative collection of local history through photos, plaques and pieces of vintage farm machinery. Internal access to the museum is available during the Yelbeni Store shop hours as a key can only be acquired through the store. 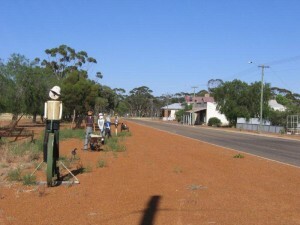 Located between Trayning and Nungarin along the Pioneers Pathway, Kununoppin is in the Shire of Trayning. This delightful small town is nestled in salmon gum woodland. Take time to meander through its streets to discover the tin sculptures scattered here and there. Seek out the swaggy and his dog! There is a hospital at Kununoppin and an information bay to assist travellers. The Ninghan Fitness Centre is close the Caravan Park, with up to date exercise equipment, TV/DVD player, mats and fitness balls. Day passes for the gym are available through the Trayning Shire Administration (Mon to Fri 8:30am – 4:30pm) at the rate of $10.00 per day. Also within the vicinity of the caravan park are the towns grassed/ lighted tennis courts, basketball courts, the Trayning & Districts Sporting Club with a new artificial bowling green, a lighted playground/ gas BBQ area and our beautifully maintained and managed Aquatic Centre. Situated north of Yelbeni is their picturesque 18 hole golf course. A leisurely 2.4km walk trail with interpretive signage with a ‘Meet the Plants’ theme, car park and picnic areas. The trail takes approximately 2 hours return trip to the summit, which offers spectacular views of the surrounding area. Situated on the Shires eastern boundary (27 kilometres east of Trayning), this 2,500 ha flora and fauna reserve is a nature lover’s delight. Only 24 kilometres north-east of Trayning, Yarragin Rock consists of twin monoliths rising from a flat granite outcrop and is visible from a great distance. A survey mark was placed on Yarragin Rock by HS King in July, 1889. 18 kilometres north of Trayning are the gnamma holes. Birds and other wildlife frequent the rock pools. 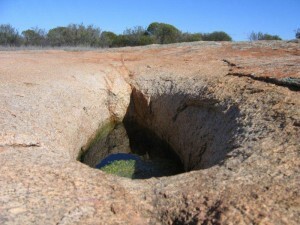 The perimeters of gnamma holes are also good places to search for native orchids and other wildflowers. This massive finger-like projection of white quartz is located at Moujakine, a few kilometres north-east of Trayning where gold was discovered in 1887.There is also a stone lined, pioneer well at Whiteman’s Rock. Located only 4.5 kilometres north of Trayning, this historic stone lined well is one of many situated along the Pioneers Pathway. For enquiries and maps please call the Shire Office on +61 8 9683 1001.